During the elections of March 15, 2017 the Dutch electorate elected the 150 members of the House of Representatives (Tweede Kamer der Staten-Generaal or Tweede Kamer), the lower house of the bicameral parliament in the Netherlands. All Dutch nationals over the age of 18 were eligible to vote in these elections, which normally take place every four years. Voting was held in a single nationwide constituency. 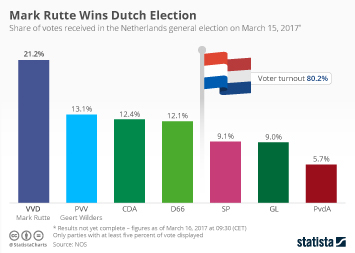 The Netherlands uses a party-list proportional representation system, in which voters vote for a specific candidate linked to a political party using an electoral list. The votes for the specific candidates are added up and determine the number of seats per party as well as the occupants of these seats. The outgoing cabinet consisted of the People’s Party for Freedom and Democracy (Volkspartij voor Vrijheid en Democratie or VVD) and the Labour Party (Partij van de Arbeid or PvdA) under the leadership of Prime Minister Mark Rutte, who had also led the previous cabinet (2010-2012). Surveys indicated early on that this coalition of PvdA and VVD would likely change after the elections, as the two cabinet parties in the polls had lost their majority. Other surveys also showed that the majority of the voters was dissatisfied with the performance of the outgoing cabinet. Despite losing some of his support, the 2017 elections were won by Prime Minister Mark Rutte and his VVD. Even with the drop in seats from 41 to 33, VVD remained the largest party in parliament, with 13 seas more than the runner up. Dominating the polls in the year leading up to the elections was Geert Wilders’ Party for Freedom (Partij voor de Vrijheid or PVV). Opinions on Wilders were divided: he was runner-up in the list of people Dutch voters would like to have as the next prime minister, but he also led the list of politicians they absolutely did not want to have in charge of the country. Running on a platform of immigration/asylum, security, the terrorism threat and the European Union, Wilders drew large popular support and finished the elections in second place, winning 20 seats, an increase of five compared to 2012. However, as all major parties ruled out the possibility of forming a coalition with Wilders, he did not become part of the new government. The third place in the elections was shared by Christian Democratic Appeal or CDA (Christen-Democratisch Appèl) and Democrats 66 or D66 (Politieke Partij Democraten 66), who won 19 seats each. To the left of the political center the biggest change was visible. Under the leadership of young Jesse Klaver GroenLinks won a historic 14 seats, the highest number of seats ever. The seats were mainly won at the expense of coalition party PvdA, which dropped from 38 to 9 seats. Newly established parties like GeenPeil, Artikel 1 and Denk received relatively large media coverage leading up to the elections, but the elections of 2017 were mostly decided among the currently seated parties. Of the new parties, only DENK and FvD (Forum voor Democratie) won three and two seats respectively. After long negotiations, Mark Rutte returned for a third term as prime minister. The new Rutte III cabinet was inaugurated on October 26, 2017. The new government consisted, next to Rutte's own VVD, of CDA, D66 and the ChristenUnie.